Cannonball and the Beast - News! Please note: this blog is in reverse chronological order. The "Last" page contains the earliest entries, and the oldest is on the bottom. Hello Cannonballers, I have been exploring the possibility of putting on another Cannonball event in September 2014. Although no route has been chosen, it would be coast to coast. Allowing motorcycles built in 1936 and earlier. The entry fee would be $2500. In order to pull it off I would need at least 60 riders willing to commit to the event before we can move forward. I currently have about 40 riders who have committed to the run. If you or anyone you know wants in please contact me and I'll put you on the list. This is only a preliminary list to see if another event is worth the time and effort. If we can confirm enough riders then the event will be officially announced before September of this year. I did not respond to Lonnie. The Beast and I have done our Cannonball. Felicia Morgan captured some wonderful photographs of the 2012 Cannonball. She published some of them as well as an article in the Thunder Press in March. She was kind enough to give me the link to the article. So, ignoring the one-off bikes, BMWs and Hendersons were essentially the same and did better than Harleys. Indians did not do well. Even the BSA singles beat them. Yikes. As you would expect, and as shown above, the bigger the displacement, the better the average mileage. Now, which were the better bikes within each class? The BSAs were the class of their class, I. Class II leaders were the Excelsior and the BMWs. Harleys were about average. Indians were dead last. In class III the Hendersons fared better than Harleys. How did specific models of motorcycles perform? Interesting. The Js did better than the JDs by a lot. The Henderson KJs showed a bit better that the Deluxe models. Only the Indian Chief showed above the average. The rest of the Indians did poorly. More Harleys finished all miles than did Hendersons. But 8 Harleys is only 20% of the 40 Harley entrants while 7 Hendersons is 47% of the 15 entrants. Similarly one BMW is 33%, two Indians is 25%, and one Excelsior is 100% of the entrants. 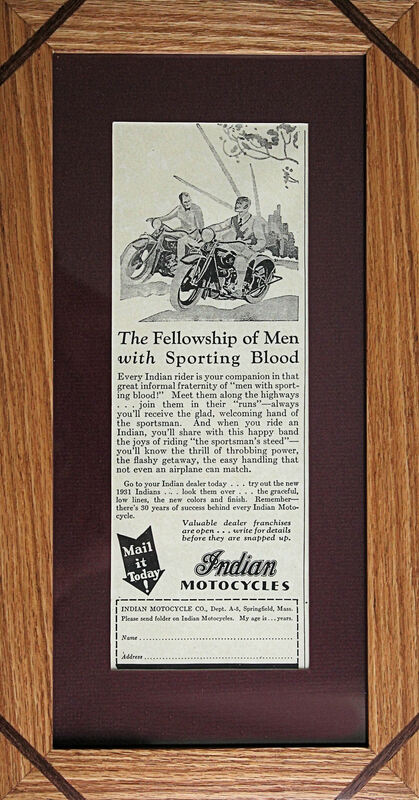 In other words, half the Excelsiors and Hendersons finished perfectly, while only a fifth of the Harleys did so. BMWs and Indians fell in between. 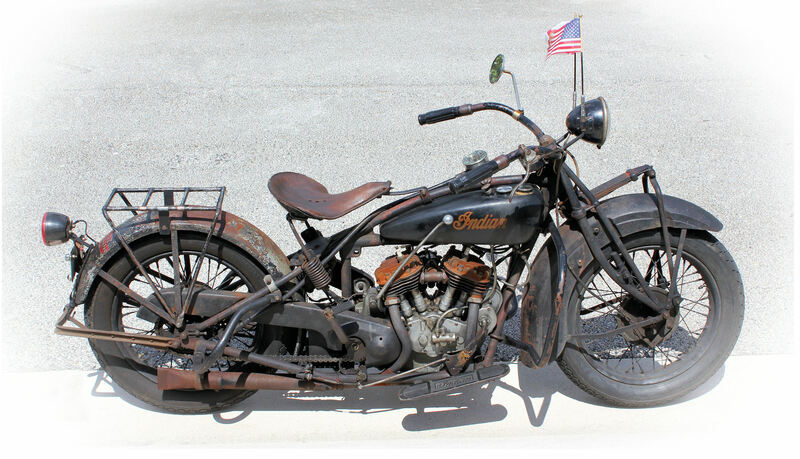 Looking only at Indian 101 Scouts, one third finished all the miles, similar to the BMWs. Given the small sample size of some models in the population of Cannonball entrants my observations may not be statistically significant. But, they are interesting. In other words, therapy won't do me much more good. The Doctor said "that's about all the motion you can expect to get back after a dislocation." (or words to that effect). I'm free (but a bit malformed). One of my lifelong dreams was to ride an Indian 101 Scout across the United States, coast to coast. This dream ended in the summer of 2011 when I discovered that my balance on two wheels was no longer good enough to continue riding. I decided then to sell my Scout and Sweetheart sidecar and just enjoy working on this very special motorcycle. Until, Jeff Alperin, owner of a 101 Scout I had sold to him many years ago came calling. 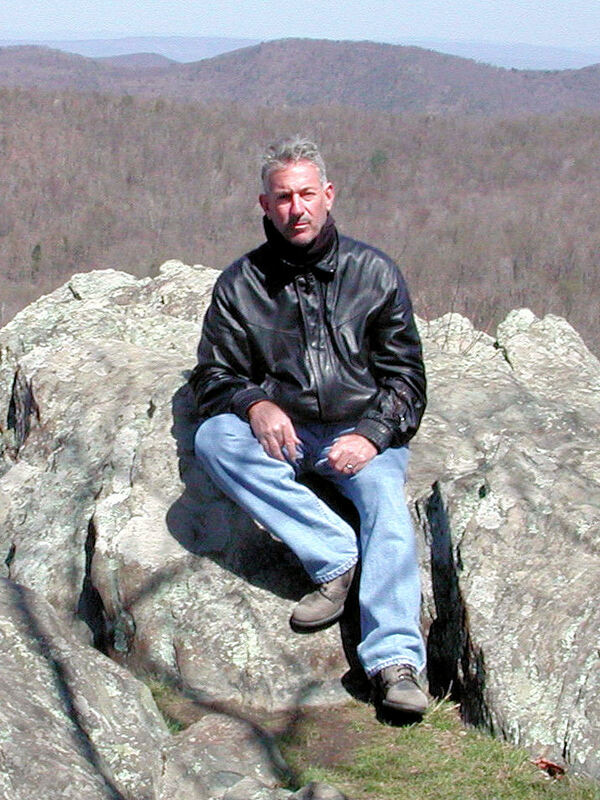 Jeff wanted to participate in the 2012 Cannonball Endurance run across the United States during the month of September 2012. He needed me, my car and trailer to back him up. I didn’t agree right away but did see an opportunity to at least be there with a 101 Scout as Jeff piloted it across the continent. It’s all history now, as I write this article, we did it, Jeff did ride his Scout as Tim Raindle and I accompanied him in a support position. Sixty-Nine pre 1930 motorcycles signed up, six of them Indian 101 Scouts. The six 101s were ridden by Jeff Alperin, Josh Wilson, Doug Wothke, Steve Rinker, Ian Patton and Marcin Grela. Two of the 101s finished with a perfect score, Jeff Alperin and Josh Wilson, both covering three thousand nine hundred and fifty six miles on time. Other factors such as the age of the motorcycle and the age of the rider entered into placement of finishing order. This put Jeff in fourth place and Josh in fifth place overall. How many of the six 101s finished? Three is the answer, Jeff, Josh and Doug. Doug covered two thousand five hundred and forty seven miles. Of the other three, Marcin covered four hundred thirty six miles, Ian covered thirteen hundred thirty five miles and Steve covered three thousand and thirty four miles. Why didn’t all six 101s finish? Some was preparation and some was in the way these motorcycles were rebuilt and some was just plain bad luck. One thing kept cropping up and that was that the more the motorcycles were kept just plain, as they were manufactured, the better chance they had. 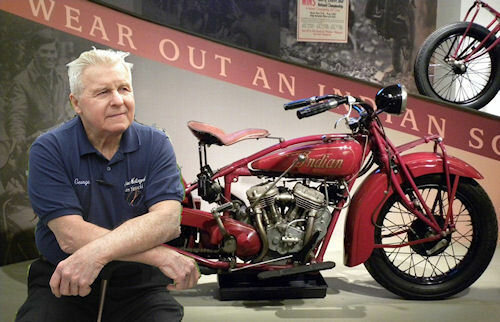 The Indian 101 Scout is perhaps the best motorcycle ever built by the Indian factory and needs no “improvement.” Jeff made nearly every mountain in high gear and believe me, there were mountains! Altitude wasn’t a problem either. Standard brakes served Jeff well even with his injured right foot and hand. Lonnie Isam and his crew deserve much credit for putting this epic event together. The amount of event preparation these people did is staggering to contemplate. Again, the Indian 101 Scout has proven its worth and why some of us have grouped together as the 101 Association to celebrate this wonderful motorcycle. Now that a subsequent 101 Association Newsletter has been published, I trust that the members won't mind me sharing this article with you. WOW 2012 No. 4. Today I rode the Beast ten miles around the neighborhood. That' my first ride of the year. It's actually my first ride since I dropped the Bonneville in November. And, it's my first Beast ride since the Cannonball. Iv'e gone from averaging 300 miles per day to under one mile per week. Here's my abbreviated Beast report - Cons: The meter leaks oil and the new tires leak air. The Dunlop Gold Seal K10 tires now on The Beast do not provide the same effortless stability in turns and assuring grip in stops that the Metzeler ME77 tires used to deliver. Pros: Everything else. The Beast sounds and runs like rusted perfection. If I weren't still in physical therapy for the dislocated thumb I might have gone eleven or twelve miles. Don't forget Dania Beach on Saturday. One Cannonball Motocycle and three Cannonball Motorcycles will be featured. My hip doctor released me on Monday. My ankle doctor released me today. But, yesterday, my thumb doctor gave me two steroid shots and sent me back for more therapy. Actually, it is The Beast that's on Clare Frost's Dania Beach Vintage Motorcycle Show Facebook page. Leni and I arrived back in Florida on January 3. 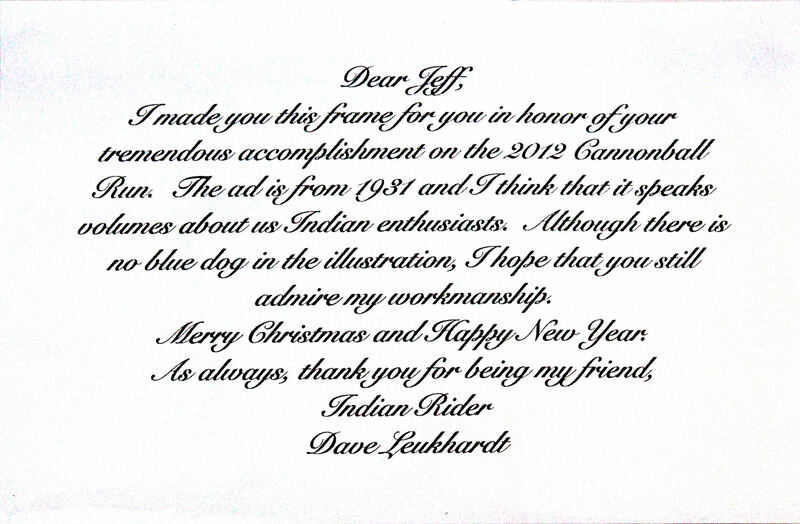 Mail delivery resumed the next day and contained a wonderful gift from Dr. David Leukhardt. Thank you for being my friend, Dave.